The Video Contest News Is Spreading! Thank you to everyone who has already submitted! We love watching your videos! Also, if you could help us spread the news by sharing our updates on facebook (http://www.facebook.com/EveryAppliancePart), twitter (https://twitter.com/EvAppliancePart), and google+ (https://plus.google.com/b/118315169188819195203/118315169188819195203/posts) pages! Thank you!! Check out all of these sites that posted our press release about our video contest! Thanks to all these websites, check them out and read about our contest! I NEED A NEW APPLIANCE VIDEO CONTEST! Make sure you enter in your name and email when you vote to enter for a chance to win a new iPad 3rd Generation! So if you are in need of a new appliance and have what it takes to make an awesome video, then submit for a chance to win new appliances! There are some simple and easy tips on how to maintain and even extend the life of your dryer. Dryers are quite an investment, so we might as well keep them running as smoothly as possible for as long as possible. Make sure to clean the lint screen after/before every load (I always double check before I start a new load in case the person before me forgot to empty it). Once a month, clean the lint screen with soap and water (especially if you use dryer sheets) to allow maximum air movement through the lint trap. Cleaning the screen gets the waxy layer off of it, which otherwise prevents air from going through it, slowing the dryers efficiency in drying your clothes. If you plan to do this yourself, you will need a dryer vent cleaner kit. Most kits come with a wire long enough for both long and short vent systems. You’ll need to remove the flapper from the dryer vent on the outside of your house and unhook the vent line from your dryer. All you have to do is push the brush through the vent line a couple of times and pull out the built up lint. After, you just need to reconnect your vent line, and reattach the flapper to the vent on the outside of your house. Clean the exterior from any lint or dust that has built up. Make sure to get into the little nooks and crannies that are often overlooked such as the lip inside of the lint filter, the area between the dryer door and the tub, and also underneath the machine as well as the sides. Most importantly, dryer maintance prevents lint fires, which can cause damage, not only to your home, but also emotionally. Have you noticed that your clothes have been smelling a bit sour even after you wash and dry them? I have recently encountered the same problem, I would wash and dry my clothes and when I took them out they did not smell clean at all, they had a foul sour odor to them. So I would go through the process of re-washing them, hoping that would help to take the smell out. But after re-washing I would be defeated and the clothes still had that same odor. I had no idea why, so I did what any person would do, I went online and used Google. I read a few forums, blogs, and yahoo! Answers, some of these answers said I need to just buy a new washer or dryer! I thought to myself, “That is crazy there has to be another answer, my washer and dryer are brand new!” So I moved along from that answer and kept up my search. In almost every blog or appliance forum I read, “try cleaning the washer.” I always just thought my washer got cleaned while I was washing my clothes. To my surprise I was extremely wrong! 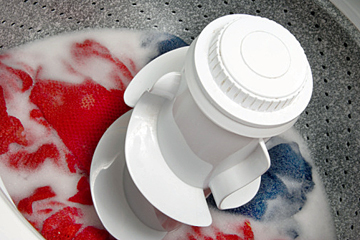 You have to clean your washer at least 2-4 times a year to prevent the build up of mold, mildew, and soap scum. These are all the culprits causing my clothes to smell sour. So I tried what one article said and just put some bleach in the washer with hot water and let it run through a cycle. This sadly did not work, the clothes still smelled. So I went back online and searched for a different way to clean my washer. I finally found my answer on Pinterest there was a link to an article on “How to clean your top loading washing machine”. After reading this article I gave it a try, and it worked! Let me tell you, I was ecstatic my clothes smelled great again and my washer has never looked better! The instructions in the article are very easy, and have amazing results! Step one: Fill your top loading washing machine with HOT water and add one quart of bleach. Step two: After the bleach is added to the hot water, let the washer agitate for one minute or so ( I let it agitate for about three minutes). Step three: Then after you let it agitate let the water and bleach combination site for one hour, NO AGITATION just let it SIT! Step four: After the one hour is up let the washer run through its longest spin cycle. Step five: When the cycle is complete immediately re-fill the washer with HOT water again and add one quart of distilled white vinegar. Step six: (repeat step two) Let vinegar and hot water combination agitate for one minute or so. Step seven: (repeat step three) Let combination sit for one hour. Step eight: While the solution of vinegar and water is sitting take a sponge or a cloth and clean the rest of the washer. This includes the lid, knobs, exterior, bleach dispenser, fabric softener dispenser, everything! Step nine: When the hour is up run the washer again on the longest spin cycle. After the washer is done with the last longest spin cycle you are done cleaning! It is that simple and the washer is removed of any odor causing bacteria and the washer looks amazing! After I finished this cleaning my clothes smelled great again! Happy cleaning everyone! Hello everyone! Every Appliance Part has a brand new website that launched July 1st, 2012. Everyone check it out!